If historians could accrue appropriate adjectives the way some jazz performers used to do (the Divine Sarah Vaughan, the Amazing Jimmy Smith), then I've often opined that the unbelievably prolific Prof. Black should be the Ubiquitous Jeremy Black, not least because his scholarship has lifted its leg on a ridiculously broad array of issues in the long 18th century, but also because I have never been to an archive to look at a manuscript where they keep records of previous consultants of whatever material I've examined and NOT seen Black's name somewhere on the list of prior readers. His breadth of interest and engagement in the relative archival material of whatever his current topic of research is (apparently) unsurpassed. The present volume is rather more dependent on extant secondary material than most Black works in part because he is engaged in revising pre-existing theses about European warfare. So naturally the notes are chock a block with Additional manuscript numbers in the British Library, Bodleian papers of one kind or another, India Office records, PRO records and much more, but they are also replete with a sustained engagement with the scholarly literature on this topic. The reason for this is that Black's brief in this book is to revise Michael Roberts' 1955 thesis about the nature of change in European warfare in this period. To some extent, Black's effort is continuing the work of Geoffrey Parker in redating some of Roberts' conclusions. Roberts' thesis, in short, is that the development of new military strategies and technologies from about 1550 through say 1630 merited the term 'revolutionary'—that they form an historical break with what came before and after. Black argues this is misleading on several counts. He suggests the evidence for stasis in these matters prior to 1550 is overblown. More importantly, he wants to date the era of real changes, following and building on Parker, to the beginning of the long eighteenth century (1660-1720). This argument underwrites his meticulous survey of military strategy and technology in the period. The writing itself is a little dry—Black is never a popularizer and writes for scholars. This isn't to suggest the book is loaded with jargon however; it is not. There's just no catering to those who need biographical or geographical lessons. If you can't tell Marlborough from Massena or Bavaria from Bohemia, Black certainly isn't going to do it. Even those for whom this is old hat may find themselves popping over to Wikipedia for a refresher course on the Maratha Confederacy or the Asiento. Though there's not much to dislike here there are plenty of details to daunt. Would be nice if Black occasionally made more reference back to his overarching thesis in the later chapters, so as to tie together the details a bit more. Even the conclusion seems less interested in reiterating his main claim and linking it to the discussions in the middle of the book than to looking forward to later military (post-Napoleonic) developments that more obviously merit that fraught term 'revolutionary'. 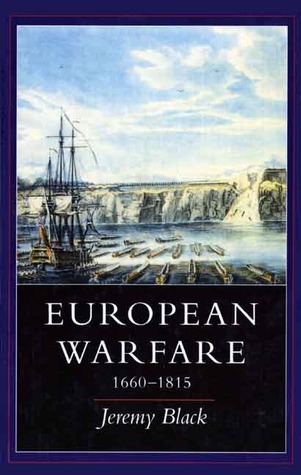 In short, if you want to know things like the value of socket versus plug bayonets and their use by, say, Wellington, or the gradual evolution of light infantry to harass defensive positions prior to a charge, or the sheer tonnage displaced by the various navies throughout the period in question, this is your book. Good info and well written. Enjoyed it. Jeremy Black - Professor Jeremy Black MBE (born 30 October 1955) is a British historian and a Professor of History at the University of Exeter. He is a senior fellow at the Center for the Study of America and the West at the Foreign Policy Research Institute. He is the author of over 100 books, principally but not exclusively on 18th-century British politics and international relations, and has been described as "the most prolific historical scholar of our age".Black graduated from Queens' College, Cambridge with a starred first, and then undertook postgraduate work at St John's and Merton Colleges, Oxford. He taught at Durham University for 16 years from 1980 to 1996, firstly as a lecturer and then as a Professor. In 1996 he moved to Exeter University where he took up the post of Professor of History. He has lectured extensively in Australasia, Canada, Denmark, France, Germany, Italy and the Ue was editor of Archives, the journal of the British Records Association, from 1989 to 2005. He has served on the Council of the British Records Association (1989–2005); the Council of the Royal Historical Society (1993–1996 and 1997–2000); and the Council of the List and Index Society (from 1997). He has sat on the editorial boards of History Today, International History Review, Journal of Military History, Media History and the Journal of the Royal United Services Institute (now the RUSI Journal). He is an advisory fellow of the Barsanti Military History Center at the University of North Texas.He was awarded an MBE in 2000 for services to stamp design, as advisor to the Royal Mail from 1997.